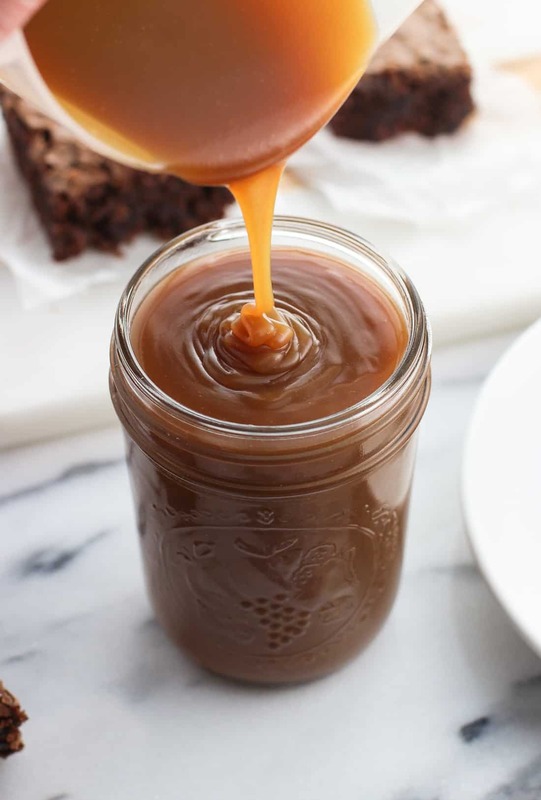 Homemade salted caramel sauce uses just a handful of ingredients and isn’t complicated to make. Its sweet and salty flavor makes this thick and pourable sauce the perfect addition to all types of desserts. 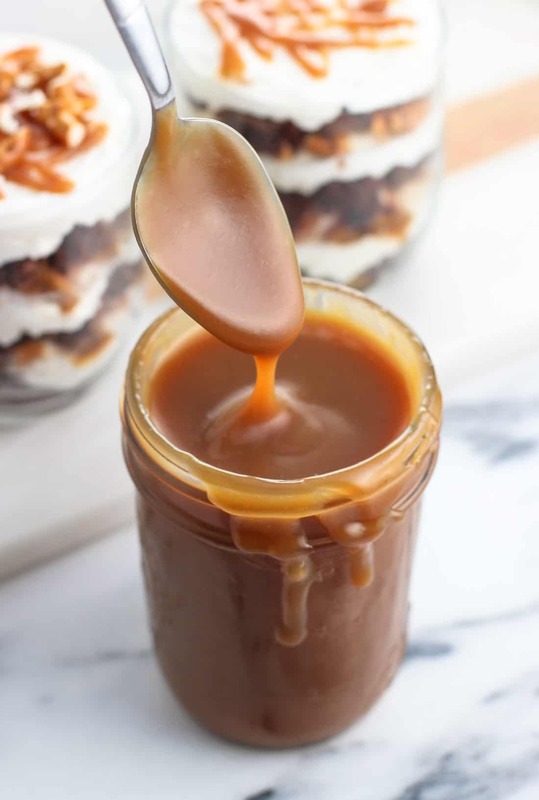 Smooth, rich, and classic describes homemade salted caramel sauce to a T. It’s hard to think of a dessert it doesn’t take to the next level, and it embodies the perfect combination of sweet and salty that make desserts like sweet and salty Oreo peppermint bark so irresistible. Despite having just a handful-ish of ingredients and steps, it’s not exactly the easiest recipe to make. Basically the opposite of ‘set it and forget it‘, as things can go sideways in the course of a few seconds from a variety of innocent-seeming actions. I’ve ruined a batch (or four) of caramel sauce before, but by keeping a few pointers in mind, you’ll be on your way to making reliably delicious salted caramel sauce. 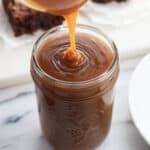 If you’re not familiar with homemade salted caramel sauce (or really, any caramel sauce), one look at the ingredients above and it’s tough to envision how simple kitchen staples like sugar, cream, and butter can come together to make roasty toasty pourable caramel. Really the science behind it comes down to what happens to sugar when it heats. It loses its granulated shape, liquefies, and begins to emit a sweet fragrance. As it bubbles and cooks it’ll transform from colorless to yellow to a deep amber, at which point it’s caramelized. 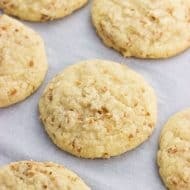 Cream and butter add richness and thickness, while vanilla extract adds to the flavor. Technically you could stop there and have a delicious, spoonable caramel sauce, but a little bit of salt brings that sweet + salty element that adds an extra good element to just about any recipe that calls for caramel sauce. 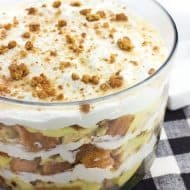 I use this homemade salted caramel sauce judiciously in trifles like the ones you see in the background of the photo below (recipe coming soon! ), but this is absolutely delicious on grilled angel food cake with pineapple, coconut, and caramel and pineapple turnovers with coconut and caramel sauce. (1) VERY IMPORTANT: You want to use at least a medium-sized saucepan for this homemade salted caramel sauce. Please don’t skimp and try to get by with a small one. The caramelized sugar mixture bubbles up a ton when the cream is added so you’ll want ample extra space to accommodate it. This is equally in part so the caramel sauce doesn’t bubble over onto the stovetop and also to prevent this hot and sticky mixture from burning you. Also I’m a bit of a scaredy cat when it comes to burns so I wore an oven mitt while whisking at this point. (2) ALSO VERY IMPORTANT: It might seem counter-intuitive, but please don’t stir the sugar until it’s that deep roasty amber color and it’s time to whisk in the cream! After seeing a caramel sauce recipe in a printed cookbook that called for lots of stirring I gave that method a whirl and holy smokes – it was a disaster. I believe the downfall came from the motion of stirring causing some granulated sugar to stick to the sides of the saucepan and not dissolve with the rest. I stirred stirred stirred while it was bubbling away until before it even began browning, the mixture rapidly turned into something that resembled clumped borax. After some research it seems like the still-granulated sugar coming into contact with the bubbling sugar can cause a chain reaction of some sort where the whole batch rapidly crystallizes. Not good! I went back to my old hands-free method and with the same ingredients and quantities, it works like a charm. Add sugar and water to a medium-large sauce pan and gently stir together, taking care not to splash the mixture up onto the sides of the saucepan. Set saucepan over medium to medium-high heat and let cook for 12-15 minutes without stirring. Keep a close eye as you'll want to remove the saucepan from the heat when the mixture is deep amber in color -- this happens quickly at the end of the cooking process. 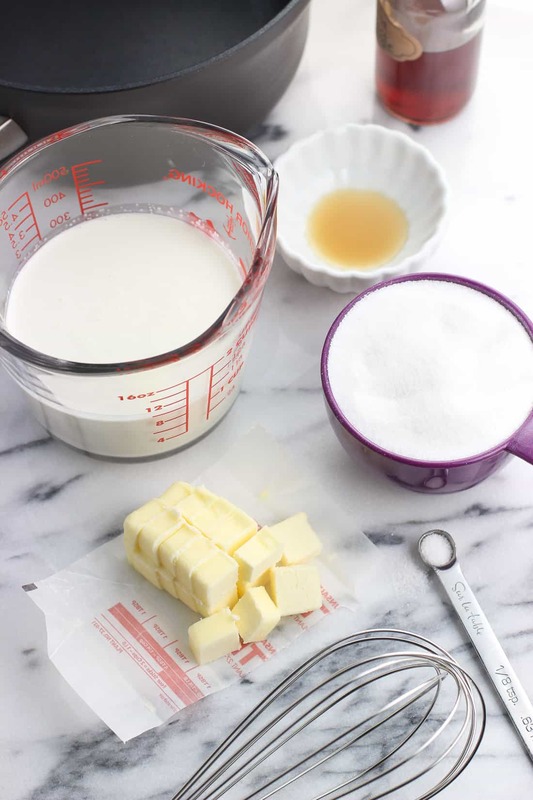 While the sugar mixture is cooking, heat the cream in the microwave or another saucepan until it's warmed. Set aside. 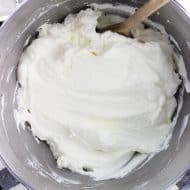 Once the sugar mixture is deep amber in color, immediately remove it from the heat and very slowly pour in the warmed cream and whisk. The mixture will bubble up A LOT so please be careful to avoid coming into contact with the caramel. Once the cream is fully whisked into the caramel, add the butter, vanilla extract, and salt and whisk until smooth. Put the saucepan back on the stovetop over low heat and whisk for 1-2 minutes as it thickens, then remove from heat again. Let salted caramel sauce cool to room temperature, then store in the refrigerator. 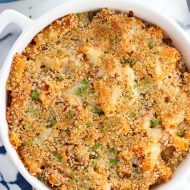 It'll thicken as it cools and is chilled, so you may wish to warm it before serving. Take a look at the bulleted recipe notes above for some important tips. TL;DR - 1) Use a saucepan with lots of extra room, 2) NO stirring, 3) Cream room temperature or warmer. Have you ever tried a non-dairy version of caramel? Hi Judith, I have actually! A few years ago I loosely followed this recipe: http://www.geniuskitchen.com/recipe/vegan-caramel-sauce-479018 for the caramel sauce you see in this post: https://www.mysequinedlife.com/grilled-angel-food-cake-with-pineapple-coconut-and-caramel/ . It’s been some time since I’ve made it but it was pretty good! I used regular sugar instead of brown which is why it’s so light in the photos of the grilled angel food cake. 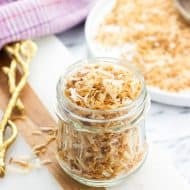 Also I’m thinking that potentially instead of cream/butter here there could be coconut milk/coconut oil or vegan butter, but I haven’t tried it and couldn’t say it would work just so as caramel sauce can be finicky. I hope that’s helpful!